NTS Los Angeles and NTS El Segundo comprise a significant portion of NTS’ Southern California Space & Satellite testing expertise. The facilities are managed by our expert team of engineering and test professionals at the LAX facility and share an expert staff of highly experienced engineers and technicians supported by state-of-the-art facilities to provide a full range of qualification, compliance and reliability testing to customers throughout the world. Leveraging a unique blend of specialized engineering and customized facilities, we can economically test items from solar panels to satellites to circuit boards. To keep your program on schedule, NTS’ in-house services such as fixture fabrication and instrument calibration are ready to go to work for you. Our Los Angeles engineers and technicians specialize in supporting the world’s most quality conscious industries, including aerospace, defense, electronics and other high tech enterprises. With some of the most extensive space simulation capabilities available, we can meet almost any space simulation requirement. 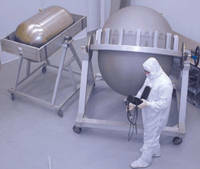 In addition to smaller TVAC chambers, NTS Los Angeles designed and built, and now maintains and operates a TV-25 (25 feet long by 15 feet deep) thermal vacuum test facility for client-spaceflight hardware. We use one control room, two client rooms, a 3-ton crane within a class 100,000 Clean Room, two gowning areas and two uninterruptible power sources connected to an automatically engaged backup generator. 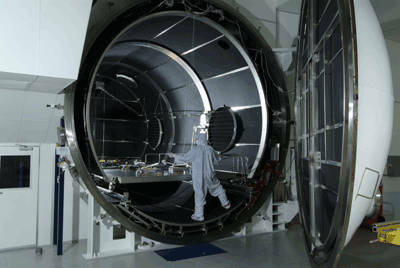 Thermal vacuum testing for a wide range of components. Multiple PID controlled thermal zones to minimize temperature gradient. Large size accommodates reflectors, solar panels and small satellites. As experts in the performance of a wide array of environmental simulations including space, thermal, shock, and vibration, our engineers are supported by the latest technology and an arsenal of capabilities. NTS Los Angeles has a large selection of temperature/humidity chambers, including a temperature/altitude chamber up to 60,000 feet; space simulators, acoustic noise, salt fog, sand and dust chambers; solar load test; and thermal shock chambers (air-air and liquid-liquid). Check out our white paper “Force Limited Vibration Testing” conducted on the CloudSAT satellite. Sine, random, sine-on-random and synthesized shock. Temperature / humidity chambers and temperature / altitude chamber – up to 60,000 feet. Space simulators: Acoustic noise, salt fog, sand and dust chambers, acceleration, bake out and thermal cycling. Solar load test and thermal shock chambers – air-air and liquid-liquid. Structural, pressure and helium leak testing of lines and components up to 40,000 psi. Aging at 125o C/minute transition rate. FED-STD-209 – Class 10,000 and Class 100 Clean Rooms. Propellant systems, hydraulic components and cryogenic components. Nitric and citric acid passivation, hydrofluoric acid pickle/etching and aluminum deoxidation. NASA, AMS, SAE, ARP, ASTM and NAS; Industrial cleaning and compressed gas association. Primary specifications include MIL-STD 810, MIL-STD 202, RTCA DO160, ISTA, ASTM and NEMA. As the preferred precision cleaning supplier for many of our nation’s aerospace and defense contractors, NTS is an active participant in Space, National Security and Homeland Defense Programs. These programs require the strict process and cleanliness controls that only a company with over 50 years’ experience can provide. Working closely with our client partners, we developed and implemented the cleaning processes necessary to meet the demanding level of process control and system cleanliness required for mission success. NTS continues to develop processes and techniques as new commercial space programs grow. The need to reduce costs and deliver products that meet stringent requirements on time, every time is now more important than ever. To view the full range of specs, tests and capabilities for this facility, click here to download the NTS Los Angeles fact sheet. You can also Request a Quote for your upcoming program now.